Yesterday, I had a crazy (pinch me) type moment- this one is filed at the top of the list. I was given the chance to attend an exclusive Lanvin Resort 2015 show with American Express. 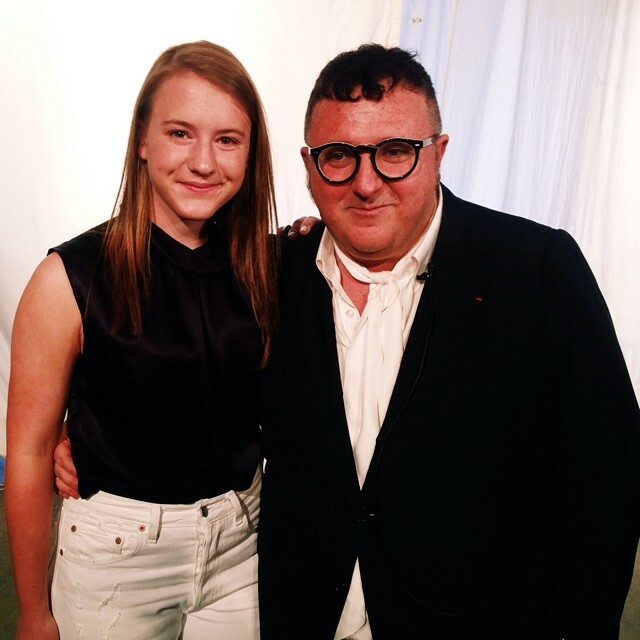 Enter the coolest part- the icon himself, Alber Elbaz was there. The artistic director behind the only single standing French house talked about the concept and creativity behind his latest collection. As fashion has become over-saturated with frivolous- essentially, things- his goal was to strip away the extravagance and keep the focus on the designs. When Alber was working under Yves Saint Laurent, the late designer taught him that fashion should never be perfect, for the sake of it simply isn't possible. Alber talked about how this has influenced his designs throughout his career by creating art within his clothes. Once again, he did not disappoint and showcased another brilliant collection. It was full of experimental fabrics shown in new ways, menswear inspired suits, but with alluring details such as sheer paneling and deep cuts. Jewels encrusted mod shifts and tops, whilst silk florals belt and neckties gave whimsy. Other than the clothes themselves, it was wonderful to hear Alber talk as if he was at a dinner party. His humbleness and humor brought a smile to every one's face (and tears to some). The one thing that he said that truly connected with me was to be small and big. He spoke about the one lesson his mother taught him was to live small- in the sense of living a fulfilling and simplistic life- and to be big- giving back to everyone and the world around you.Because when you take away the clothes and the frills, it all boils down to the living the best life you can.